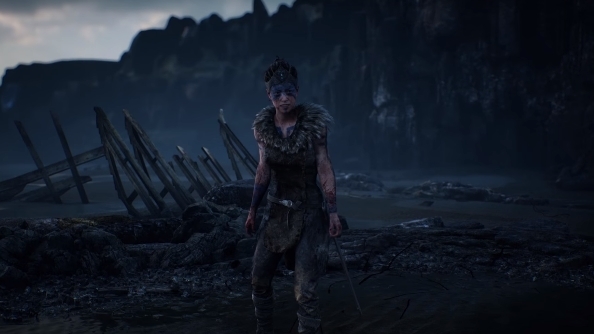 Hellblade: Senua’s Sacrifice is Ninja Theory’s new project, and it’s a pretty small one. With just about 16 team members, the developer is going full-on indie for this one. But that’s not throttling their ambition, as you can tell from yesterday’s beautiful Hellblade trailer. Rather than regressing to simple techniques, Hellblade features a world-first: motion-capture tech that allows an actor to perform within the game world. Hellblade is absolutely destined to become one of the best looking games on PC if this trailer is to be believed. This developer diary delves deep into the process. Aside from all the impressive Unreal 4 tech and input from various different capture and graphics companies, the key thing to take away is just how the avatar is achieved. Rather than an actor performing lines and actions which are then taken away and used to generate a character, the character model is created first, and placed into a game world. Then, when the actor performs, the character does exactly the same within the game world simultaneously. This kind of technology is no doubt an amazing breakthrough for game directors: if the mo-cap data doesn’t quite work as intended in the game world, you just do another take. Being able to see the end results immediately is surely a great thing for efficiency. Ninja Theory also claim that it’s the next step in being able to make characters interact with players in ways we’ve not seen before, although they remain unclear on exactly what those possibilities could be. If you need reminding of the end result, take a look at the trailer which was shown off at GDC this week. The technology has certainly created an incredible-looking character in Senua, and hopefully this is just the beginning for a new generation of amazing game characters and creatures.